Are you sick and tired of constantly having allergy attacks in your home or office? Then I have very good news for you. Have you ever heard of Chlorine Dioxide Gas? Watch the video testimony from Dr. Tiffany Sturgeon. 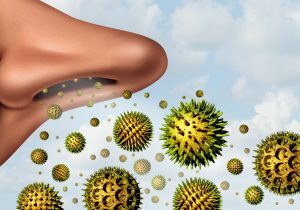 You will learn why our company is willing to pay you $200.00 AND NO CHARGE for our service, if the Anti-Allergen process of your home or office fails to give you indoor allergy relief within 24 hours from the time we start the dramatic reduction of allergens in your home. Elevated Indoor Mold Spore counts are a major cause of allergy attacks throughout the world. A friend of mine, Kathy Sorensen in Colorado, got mold poisoning nearly 18 years ago and is highly allergic to mold. There are several articles that show how CLO2 is used to combat mold in indoor environments. Check out this article from OU’s Bizzell Memorial Library. The Library used Chlorine Dioxide to fight the elevated mold growth and also used it to keep the mold from coming back, along with greatly reducing the spore count. Do You Need Quick Allergy Relief?  Chlorine dioxide can be in a liquid or a gas and it’s used as an antiseptic in a lot of areas.  Hospitals have been using it to keep their water system free of bacteria [and] to clean the camera the camera scopes used for endoscopies and colonoscopies.  It inactivates spores [created by molds]. [Spores are] basically an inactive life form in a protective shell. The spores are formed intentionally so the mold can survive very unpleasant environments… whether that’s a very acidic environment or a very cold or hot environment. It is very hard to kill off that spore because it was created to survive the things that would usually kill it. Then when [the spore] gets in a more pleasant environment, it breaks out of its shell, comes to life and the mold begins to grow again. So, when you have any kind of disease bothered by molds, you can’t just kill the living mold. You [must] get rid of the spores – because they will just hang out and wait for their chance to grow again. Other bacteria form spores too but mold is the biggest issue.  Chlorine dioxide gas or liquid will kill bacteria [and] viruses and inactivate those molds that are so resistant to so many treatments. There are a variety of illnesses that humans suffer from: bacteria and viruses obviously and mold spores. Mold spores can cause a lot of respiratory issues, everything from severe sinus infections to severe lung disease, to triggering asthma and allergies.  Chlorine dioxide can help with all those mold spore-triggered diseases [and also] kills off the bacteria and viruses, in part because it ruins the protein that they’re made of.